While my other LP thread is on hold due to brain-mangling, hate-inducing, hair-pulling frustration (I lost an entire session's worth of screengrabs), I started getting nostalgic for one of my favorite adventure games from back in the day. The Nostalgia Goggles came off when I started to play it, though, and I'm hoping that through the course of this Let's Play, I can still have fun with this game. Ah, The Adventures Of Willy Beamish. Was any game so egregiously missed by the public? So good and yet advertised so badly? The advertisements for Willy Beamish were pretty darn misleading: "What if you were nine years old, but knew everything you know now?" I thought it was going to be like 18 Again or something. The Adventures Of Willy Beamish was one of just a few games from Sierra subsidiary Dynamix, which produced three adventure games and a couple of action games (Stellar-7 and Nova-9) before kind of vanishing off the face of the earth. Modern systems need to run it in DOSBox , a pretty darn stable DOS emulator. DOSBox does screen and video capture , too, which means this'll probably be a hybrid LP with occasional embedded You Tube videos - without me talking on a microphone. The computer I'm using doesn't have one. a coupon sheet/menu from the local pizza parlor, which had the quick launch instructions on the back and was purple and otherwise not really needed. 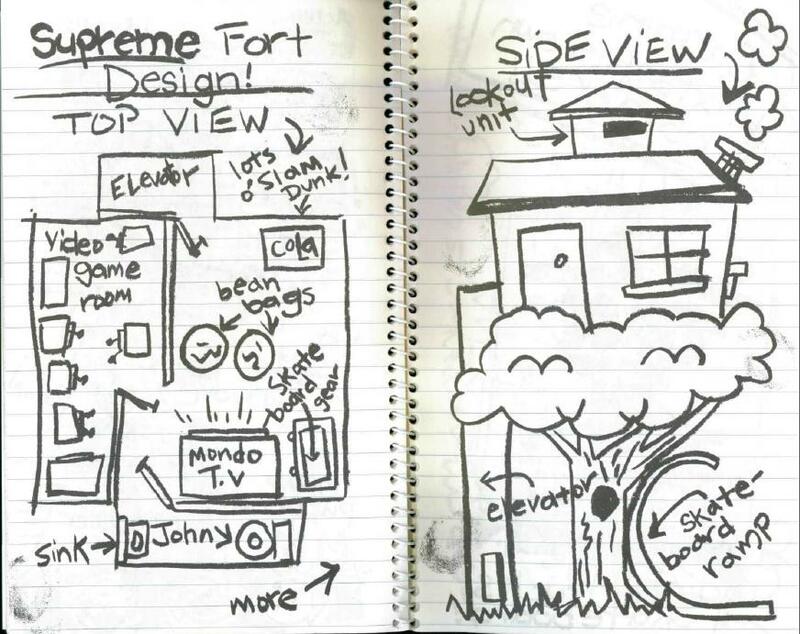 Willie's Notebook, which had a bunch of in-jokes for Sierra fans, some insight into the main character's (pretty standard) sibling rivalry, his obsession with Nintari, and a single item on a single page that is the solution to a puzzle very close to the end of the game. As this isn't a blind Let's Play, but an I-haven't-played-this-since-it-was-new Let's Play, and the magic hypnosis phrase is extremely memorable for its randomness, I won't be consulting the notebook. Actually, you know what? 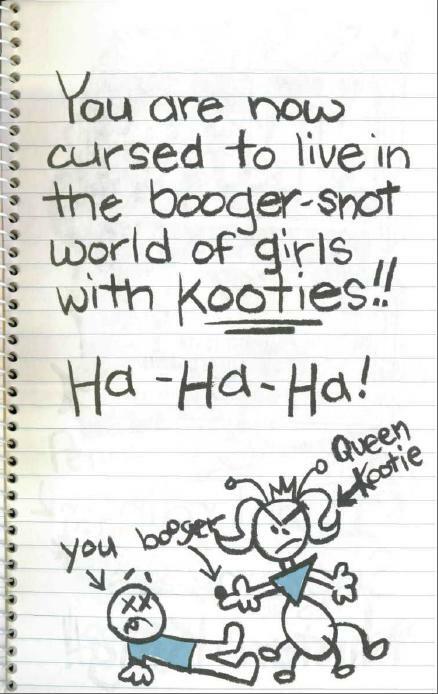 Before I start the game, I'm going to go through the notebook just for giggles. The Adventures Of Willy Beamish is kind of like being a character in a cartoon in the late 80's, and that's why I like it. Let's Play! Willy's Notebook was a blue, spiral-bound notebook that came with the game. As I said before, it had one real purpose in the game: A single page of the notebook had information needed to pass a puzzle. Still, it's worth taking a look at to give you an idea of the world and the characters in it. The front cover is defaced in standard middle-school style. He's stuck a sticker for his favorite game (Monster Squad) on it, which has begun to peel. He's drawn a Nintari logo on it, then put a Kilroy on the Nintari logo. (Yes, I'm keeping [[BlandNameProduct Nintari]] in my clipboard for this whole review, why do you ask?) It's got stains all over it, and given that he probably keeps it in his backpack, and what else he keeps in his backpack, I really don't want to know what those stains are. The first page tells us "KEEP OUT OR DIE! Stop B4 its 2 late!" Remember being that young? Despite my age, I sure do. The next two pages are the Sierra/Dynamix hintline and boilerplate for it, followed by The Curse of Willie Beamish. Willie's idea of a curse. Skimming a few pages further, we find that Willy's planned his post-game interview for the Nintari Championship this summer. First Sierra joke a few pages later: "Nerds play Police Quest!" Also a tip for Willy's favorite Nintari game (I will never tire of that pothole), "Monster Squad." Not to be confused with the movie of the same name, which it has nothing to do with. This tip is useless, as Monster Squad isn't even a mini-game in this, just an animation. Aww. Pix of Willy and his best friends, Dana and Perry. Perry's name shows up in the essay at the end of this section. The only reason I know Dana's is because it's all over the page, along with "W.B.+D.M." Willy's notebook is starting to look like it belongs to a girl his age, and not a boy. Also, on the facing page, Willy found out about his parents' secret plans to hire a BABYSITTER! This "bogus parental move" has him upset. Willy's treefort design is... ambitious. Very. A few pages later, we find out about his bestest (nonhuman) bud ever. A frog named Horny. Wait, wait. Let me use his phrasing: Horny the total "Studly" frog!! Next page? A couple of ads. The first is for a Nintari repairman. The second is an actually funny ad that comes into play late in the game. That's right, a fourth-wall-breaking Chekhov's Gun is the copy protection. You are feeling a powerful urge to pick up the phone. That's right, juuust reeelax. Don't fight it. Call meee. Call meee nowwww. Dial 1-800-555-TIZE. Call now. Dial the phone. 1-800-555-TIZE. Also, Cedric the Owl falling out of a tree, dead. Last important bit in the notebook: Willy wrote a one page paragraph essay entitled "My Best Friend." Reproduced here for your consideration. Essay in bold, Ms. Glass' notes in italics. I have a lot of cool friends like Dana and Perry, but my bestest friend is the ghost of my grandfather Beamish. He is totally awesome, even if he is dead and can't buy me ice cream anymore. He's kind of like a "fairy grandfather." He is the best, coolest, most excellent, friend I have ever had. C- This was supposed to be about someone real! Actually, Ms. Glass, it is. Unfortunately. Willy's a bit obsessed with Nintari, keeping track of his high scores and his efforts to achieve landmarks such as 1,000,000,000 and 2,000,000,000. Yes. Those are billions. Also, apparently Monster Squad is the only game for Nintari. Probably for that awesome line "Wolfman's got nards!" Then we get the writing credits for the manual and game, as written by Willy. 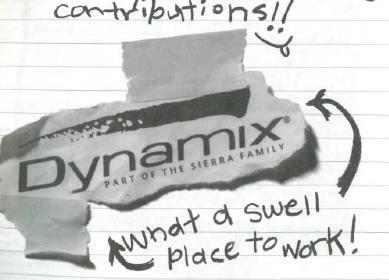 Apparently, Dynamix is "a swell place to work!" "Swell"? Really, guys? "Swell." Okay. Also, another set of exclamation point smileys. Just so you know I'm telling the truth here. Actual play starts next post.